Cannot be Normal Summoned or Set. Must be Special Summoned (from your hand) by banishing 2 "Six Samurai" monsters from your Graveyard, and cannot be Special Summoned by other ways. Once per turn: You ..
Each time a "Six Samurai" monster(s) is Normal or Special Summoned, place 2 Bushido Counters on this card. You can remove Bushido Counters from your side of the field to activate these effects. :- 2 C..
You can only control 1 face-up "Grandmaster of the Six Samurai". While you control a face-up "Six-Samurai" monster(s), you can Special Summon this card (from your hand). When this card is destroyed by.. If you control 2 or more "Six Samurai" monsters, you can Special Summon this card (from your hand). Your opponent can activate only 1 Spell/Trap Card each turn. If this card would be destroyed, you ca.. When this card is Normal Summoned: You can Special Summon 1 Level 4 or lower "Six Samurai" monster from your hand. While you control a face-up "Six Samurai" monster with a different name, this card ga..
Activate only if you control a face-up "Six Samurai" monster when your opponent activates a Spell Card, Trap Card, or Effect Monster's effect that would destroy a card(s). 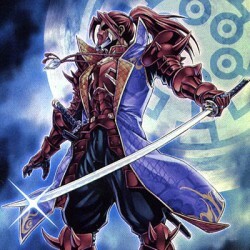 Negate the card's activation..
2 Level 4 "Six Samurai" monsters. Once per turn, during either player's turn: You can detach 1 Xyz Material from this card to target 1 face-up "Six Samurai" monster you control with less than 2000 ATK.. When this card is Normal Summoned, if you control a face-up "Six Samurai" monster, declare 1 Monster Type. While this card is face-up on the field, monsters with the declared Monster Type cannot decla.. When this card is Normal Summoned, place 1 Bushido Counter on it (max. 1). This card gains 300 ATK while it has a Bushido Counter on it. Once per turn, you can remove 1 Bushido Counter from this card ..
Each time a "Six Samurai" monster(s) is Normal or Special Summoned, place 1 Bushido Counter on this card. You can send this card to the Graveyard to Special Summon 1 "Shien" or "Six Samurai" Effect Mo..
Each time a "Six Samurai" monster(s) is Normal or Special Summoned, place 1 Bushido Counter on this card (max. 2). You can send this card to the Graveyard to draw 1 card for each Bushido Counter on th..